I have always had sensitive skin so it comes as no surprise to me that this gets worse during pregnancy. It's because of all my sensitivities that I am careful to find the best quality products AND with the least amount of chemicals in them when it comes to beauty products on a daily basis. During pregnancy, I get even more particular about what I am willing to put on my skin. With my hormones out of whack again, my skin is drastically changing like it always does when pregnant. 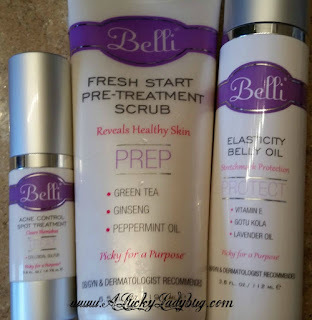 While searching out a new skincare regimen, I discovered Belli Skincare and am pretty psyched about it! 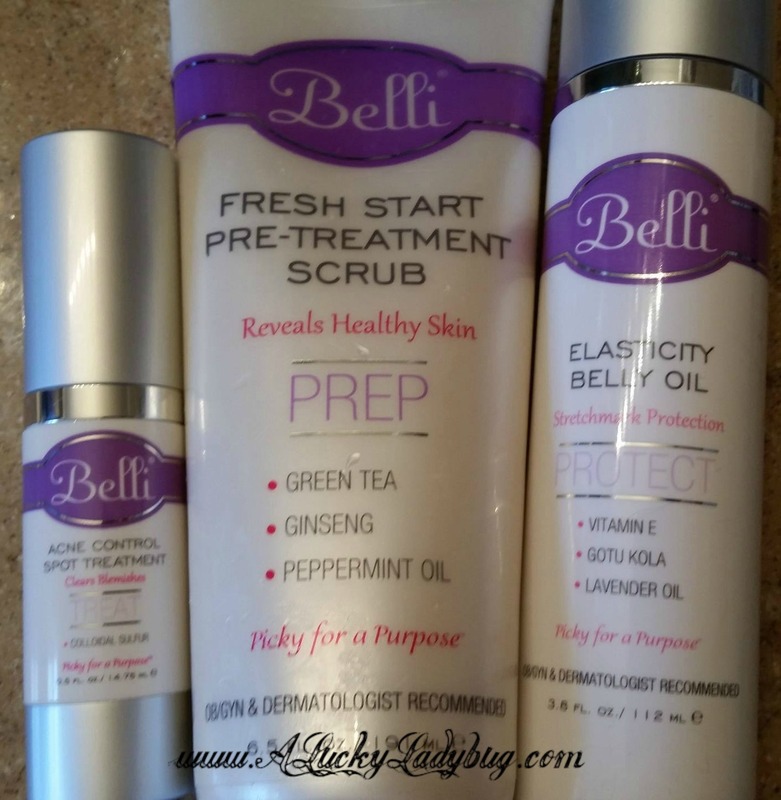 "Belli is Picky for a Purpose to give you peace of mind." 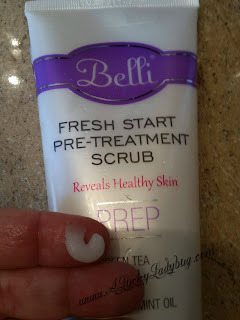 Recommended by OB/GYNs and Dermatologists, Belli is "Safety Screened to avoid harmful chemicals. Allergy Tested. Free of Paraben Preservatives and Artificial Dyes/Fragrances. No Animal Testing. Gluten-Free. Made in USA." After giving the different products a try the past few weeks, I can see why doctors are recommending the brand AND why other expecting mothers prefer them. Because Acne has been a huge concern, I've been using the Acne line products in hopes of clearing my skin up in the most gentle manner. Each step in the kit helps wash, scrub, treat, and moisturize using all natural ingredients. Not only are these safe for baby, but some are even geared towards helping ease other pregnancy symptoms like morning sickness. Anti-Blemish Facial Wash deeply cleanses skin with lactic acid without over-drying or irritation (which can cause more breakouts). Fresh Start Pre-Treatment Scrub sweeps away old skin cells and reveals new, healthy skin that is ready for treatment products. Acne Control Spot Treatment with sulfur clears acne and helps prevent new breakouts. Healthy Glow Facial Hydrator hydrates the skin and provides an anti-oxidant boost of Vitamin C.
My absolute favorite of all the Belli products has been the Fresh Start Pre-Treatment Scrub. I've been keeping it in the shower for use on my face as well as any other problem areas of the body that come up. Having terrible morning sickness throughout the whole first trimester, I love the relaxing scent of peppermint oil that fills the shower when using this. The scrub is gentle on my sensitive skin, yet strong enough it's had my skin glowing like it should while pregnant! 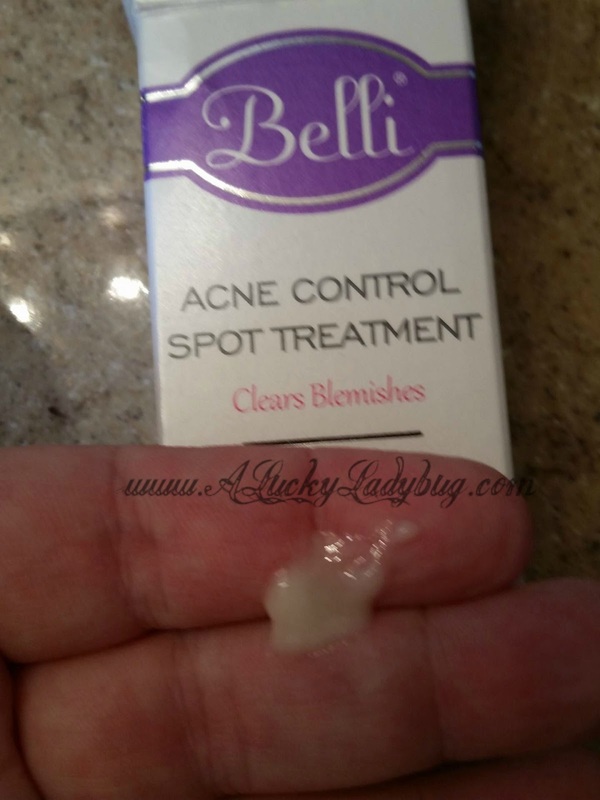 Belli has even more available to help enhance that natural pregnancy glow if you are looking for more than acne help. Work on your baby bump and keep it looking as beautiful as ever. No stretchmarks or itchy skin during pregnancy! Start thinking towards the future, prepare your skin for after baby and keep feeling good. While I haven't tried even a fraction of the products, I sure plan to with all they have going on for each and every need I might have before, during, and after pregnancy! I wish I had been able to try this when I was pregnant! Actually, I tried this (& no, I wasn't pregnant, lol.) It works great on any skin...you don't have to be pregnant.